علیشیری, علی, فتائی, ابراهیم. (1394). بهبود فعالیت میکروارگانسیم‌ها در غلظت‌های مختلف اسید فولیک، نیتروژن و فسفر در تصفیه بیولوژیکی فاضلاب پتروشیمی تبریز. مجله آب و فاضلاب, 26(4), 121-129. علی علیشیری; ابراهیم فتائی. "بهبود فعالیت میکروارگانسیم‌ها در غلظت‌های مختلف اسید فولیک، نیتروژن و فسفر در تصفیه بیولوژیکی فاضلاب پتروشیمی تبریز". مجله آب و فاضلاب, 26, 4, 1394, 121-129. علیشیری, علی, فتائی, ابراهیم. (1394). 'بهبود فعالیت میکروارگانسیم‌ها در غلظت‌های مختلف اسید فولیک، نیتروژن و فسفر در تصفیه بیولوژیکی فاضلاب پتروشیمی تبریز', مجله آب و فاضلاب, 26(4), pp. 121-129. علیشیری, علی, فتائی, ابراهیم. بهبود فعالیت میکروارگانسیم‌ها در غلظت‌های مختلف اسید فولیک، نیتروژن و فسفر در تصفیه بیولوژیکی فاضلاب پتروشیمی تبریز. مجله آب و فاضلاب, 1394; 26(4): 121-129. عملکرد سیستم‌های تصفیه بیولوژیکی فاضلاب، به‌ وجود عوامل مختلف نظیر مواد مغذی و ویتامین‌ها بستگی دارد. در این پژوهش میزان تأثیر غلظت‌های مختلف اسید فولیک (1/0، 2/0 و ppm4/0) به همراه مقادیر مختلف نیتروژن (20، 30 و ppm40) و فسفر (4، 6 و ppm10) بر تصفیه بیولوژیکی فاضلاب صنعتی پتروشیمی تبریز مورد بررسی قرار گرفت. برای تعیین شرایط بهینه رشد میکروارگانیسم‌ها از روش تاگوچی با آرایه ارتوگونال L9 استفاده شد. مقادیر کدورت، BOD5، TSS و MLSS به‌عنوان پارامترهای اساسی تصفیه فاضلاب مورد اندازه‌گیری قرار گرفت. نتایج نشان داد که فقط تأثیر فاکتور نیتروژن در حذف BOD5 معنی‌دار بود که میزان تأثیر آن برابر 4/73درصد به‌دست آمد. اسید فولیک با 7/42 درصد بیشترین تأثیر را در کاهش TSS نشان داد. فقط کاربرد اسید فولیک در افزایش MLSS با 1/90 درصد تأثیر، معنی‌دار به‌دست آمد. غلظت‌های ppm2/0 اسید فولیک، ppm30 نیتروژن و ppm4 فسفر در سه پارامتر مورد بررسی سبب ایجاد شرایط بهینه شدند. اثرات متقابل سطح اول اسید فولیک× سطح دوم فسفر بر کاهش کدورت، سطح دوم اسید فولیک× سطح دوم فسفر بر کاهش BOD5، سطح دوم نیتروژن× سطح دوم فسفر بر کاهش TSS و سطح اول نیتروژن× سطح اول فسفر بر افزایش MLSS، دارای بیشترین تأثیر بودند. این نتایج نشان داد که افزودن اسید فولیک، نیتروژن و فسفر به فاضلاب پتروشیمی تبریز که فاقد این مواد است، علاوه بر بهبود رشد میکروارگانیسم‌ها، سبب بهبود پارامترهای پساب خروجی می‌شود. Biological treatment of wastewater depends on different factors including the nutrient and vitamin contents. In this study, the effects of different concentrations of folic acid (0.1 ppm, 0.2 ppm, and 0.4 ppm) together with different amounts of nitrogen (20 ppm, 30 ppm, and 40 ppm) and phosphorus (4 ppm, 6 ppm, and 10 ppm) were studied on the biological treatment of the industrial effluent from Tabriz Petrochemical Plant. The Taguchi method with an L9 orthogonal array was used to determine the optimum conditions for the growth of microorganisms. Turbidity, BOD5, TSS, and MLSS were measured as the main parameters of the treated effluent. The results showed that only N has a significant effect (78.4%) on BOD5 removal. Folic acid had the greatest effect (42.7%) on TSS reduction. This is while folic acid had a significant effect (90.1%) only on increasing MLSS. The optimum conditions for microorganism activity consisted of a folic acid concentration of 0.2 ppm, an N concentration of 30 ppm, and a P concentration of 4 ppm . Interactions between first level of folic acid×second level of P on turbidity reduction, second level of folic acid×second level of P on BOD5 reduction, second level of N×second level of P on TSS reduction, and first level of N×first level of P on increasing MLSS were highly significant. These results show that adding folic acid, N, and P to the effluent from Tabriz Petrochemical Plant not only enhances the growth of microorganisms but also leads to the improvement of the treated effluent for discharge into the environment. 1. 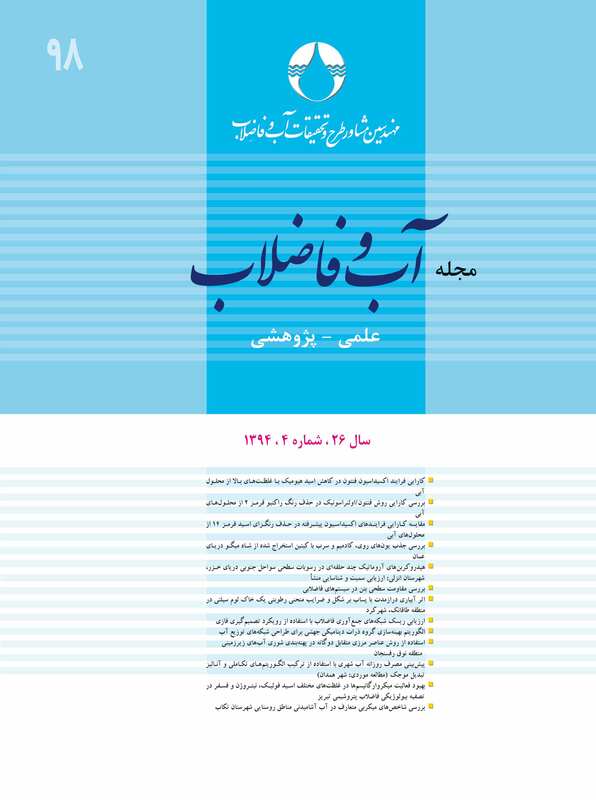 Shariatpanahi, M. (2003). Principles of environmental health, Tehran University Press, Tehran. (In Persian). 2. Nahid, P., and Kazemi, A. (2004). “Bioactivity improvement in activated sludge treatment of petroleum refinery wastewater.” J. of Water and Wastewater, 15-2 (50), 23-28. (In Persian). 3. Mittal, A., Kurup, K. L., and Gupta, V. K. (2005). “Use of waste materials--bottom ash de-oiled Soya, as potential adsorbents for the removal of Amaranth from aqueous solution.” J. of Hazard Mater., 117(2-3), 171-178. 4. Berent, J. (2001). “Current management of ethylene glycol poisoning.” J. of Drugs, 61(7), 979-988. 5. Grzes Kowiak, A. Z., Grzes Kowiak, T., Zembrzuska, J., and Lukaszewski, Z. (2006). “Comparison of biodegradation of poly (ethylene glycol) s and poly (propylene glycol) s.” Chemosphere, 64, 803-809. 6. Golbang, N., Shahiam, M. N., and Emtiazi, G. (2004). “Effect of phenol concentration on growth, respiration and biofilm formation of phenol-degrading bacteria in Isfahan steal plant wastewater.” J. of Water and Wastewater, 15-4 (52), 31-38. (In Persian). 7. Senorer, E. (2001). “Determination of effect of folic acid on biological treatment efficiency.” MSc Thesis, Istanbul University, Institute of Science and Technology, Istanbul, Turkey. 8. Maier, R. M. (1999). “Biochemical cycling.” Chapter 14. In: Maier, R. M., Pepper, I. L., and Gerba, C. P. (Eds)., Environ. Microbiol., Academic Press, Canada. 9. Hantanirina, J. M. O. (2010). “Improving BOD removal at SNJ wastewater treatment plant by biological treatment.” MSc Thesis of Environmental Engineering/Water Science and Technology, Faculty of Science and Technology, University of Stavanger, Norway. 10. Ammary, B. Y. (2004). “Nutrients requirements in biological industrial wastewater treatment.” Afr. J. of Biotechnol., 3(4), 236-238. 11. Strunkheide, J. (2004). “Stabilized folic acid vitamin for the reduction of excess sludge in sewage treatment plants.” <http://www.dosfolat.de/literatare/wwt-papers.html>. (May 2014). 12. Hassing, L., Wahlin, A., Winblad, B., and Backman, L. (1999). “Further Evidence on effects of vitamin B12 and folate levels on episodic memory functioning: a population- based study of healthy very old adults.” Soc. Biol. Psychol., 45, 1472-1483. 13. Bassler, K. H., Golly, I., Loew, D., and Pietrzik, K. (1997). Vitamin encyclopedia for doctors, pharamacists and nutritionists, 2nd Ed., Fischer verlag, Stuttgart. (In Germany). 14. Senorer, E., and Barlas, H. (2004). “Effects of folic acid on the efficiency of biological wastewater treatment.” Feresen. Environ. Bull., 13(10), 1036-1039. 15. Rapold, H., and Bacher, A. (1974). “Bacterial degradation of folic acid.” J. Gen. Microbiol., 89, 283-290. 17. Dohme, M. (1988). “The effect of folic acid on the metabolism rate of activated sludge plants as shown by the example of the Uelzen and Suderburg sewage treatment works.” Diploma Thesis, Fachhochschule Suderburg, Germany. 18. Roy, R. K. (2010). A primer on the taguchi method, 2nd Ed., Society of Manufacturing Engineers, USA. 19. Akerboom, R. K., Lutz, P., and Berger, H. F. (1994). “Folic acid reduces the use of secondary treatment additives in treating wastewater from paper recycling.” International Environmental Conference and Exhibit, TAPPI Proceedings, Oregon, Portland.